This 1x2 HDMI 4K/2K Splitter from Vanco splits a single HDMI input signal into two HDMI output signals without compression. 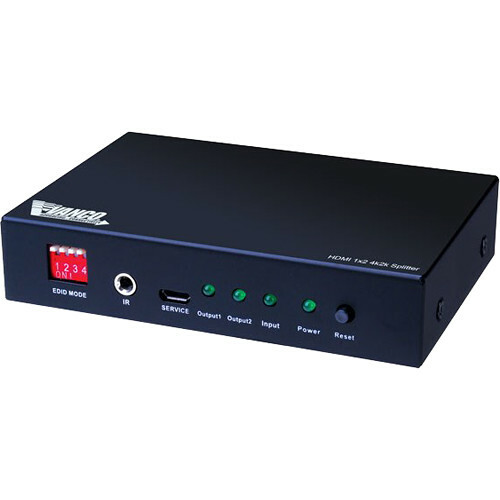 The unit is HDCP compliant and supports EDID management. The system is expandable and can be chained with additional HDMI splitters. The 1x2 splitter supports video resolutions up to UHD 4K, 36-bit Deep Color, and 3D. Supported audio formats include 5.1/7.1 Surround, DSD, HD, Dolby Digital, Dolby TrueHD, DTS, and DTS Master. An IR input on the front allows an optional IR system to be connected for display control with a separately available adapter. A 5 VDC power supply is included. Box Dimensions (LxWxH) 8.3 x 6.0 x 2.5"